With over 22 years’ IT industry experience, it is no wonder that I have gained a passion for the intoxicating flavours of a good brew of coffee. Over the years, I have definitely consumed my good share of the golden elixir, and in the various sales roles I held earlier in my career, many a deal has been struck over a napkin in a busy café. My passion for coffee is as strong as my passion for helping my customer gain control over their information using SharePoint and Office 365. Recently, I decided to take my coffee passion into the next gear and enrolled in a barista course. I was not expecting too much other than to increase my understanding of what makes a great coffee and improve my ability to make some heart or leaf art on top of my latte. I was surprised at how much science goes into making the perfect coffee, from the roasting process, understanding turn-around and the first and second cracking, through to the size of the grind and amount of coffee required for an espresso versus doppio. I learnt so much, definitely improved my coffee-making skills and reignited my love for coffee. I have been rating cafes I have visited for a few years now on my Instagram and recently turned this into a blog called CoffeeCatchup (thanks to Adam Clark for the name idea). This week, during my visit at our headquarters in Brisbane, my colleagues wanted to put my nearly acquired skills to the test. 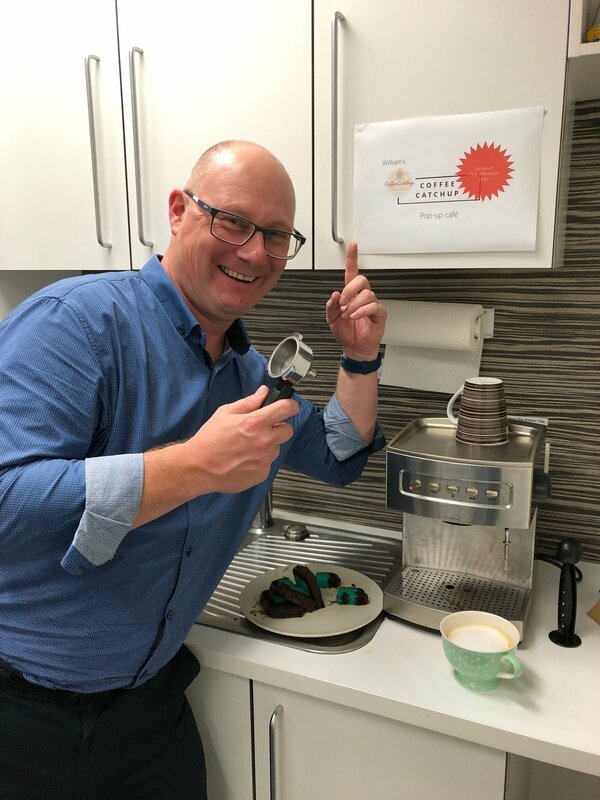 I wanted to thank Sybylla from Marketing, who produced “William’s CoffeeCatchup Pop-up Café” signs which turned the normally quiet kitchen area into a busy coffee shop (for one afternoon only). We went to our local café, Café Amaretto and purchased some of the local Fonzie Abbott blend and then I got to work. I am always happy to catch up with someone for a coffee and a decent conversation, and it doesn’t always need to be about work (that just heaps me expense them back 😊). So please reach out and I’ll be happy to shout a coffee and share my mind.